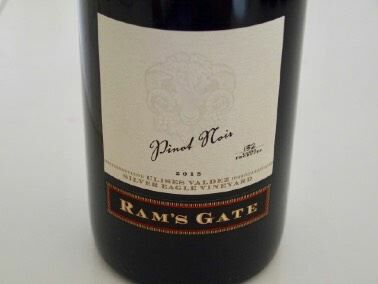 I have reiterated to readers a number of times how my wine drinking lifetime of close to fifty years coincided with the dramatic rise in excellence of California Pinot Noir. That said, the joyous ride is not over. There continues to be an embarrassment of riches and today’s overall consistent quality of California Pinot Noir has never been more extraordinary. The bar has moved to such lofty heights that large numbers of premium California Pinot Noir now receive scores of 90 or above. As winemakers continue to strive for perfection in Pinot Noir, consumers can rejoice. It’s time to toast our blessings! Dolin Malibu Estate Vineyards, established in 2005, has emerged as one of the leading producers in the Malibu Coast, a region that attained AVA status in 2014. Proprietor Elliott Dolin grew up Northern New Jersey and became an accomplished musician, working with Donna Fargo Ray Price and Brenda Lee as well as playing on recording sessions alongside Nashville’s top session players. He began to invest in real estate, moved to California and transitioned into a career in commercial real estate investment. After meeting his spouse, Lynn, in the early 1990s, he developed a passion for wine and became active in restoring vintage cars. In 2006, while restoring his recently purchased Malibu home, he saw the opportunity to grow Chardonnay and three years later, Dolin Estate Chardonnay was born. After the first three vintages of Chardonnay, the winery expanded production to include Pinot Noir from notable Santa Maria Valley vineyards. Winemaker Kirby Anderson joined the winery in 2010 and helped expand production into Central Coast Pinot Noir in 2012. A graduate of University of California at Davis, Anderson honed his winemaking skills working at Buena Vista Winery, Bernardus Winery and La Crema. In 1997, he became the winemaker for Gainey Vineyard in Santa Ynez, CA, leaving in 2008 to become a winemaking consultant. Dolin wines are available on the winery website and through a mailing list at www.dolinestate.com. The winery’s Chardonnays are reviewed later in this issue. This distinguished winery began in a vineyard in 1998, when longtime colleagues and friends Steve Dutton and Dan Goldfield recognized a shared vision to craft wines that expressed the personalities of their vineyards. Dan has become something of a winemaker emeritus based on his many years of crafting wines from cool-climate vineyards in Sonoma County. 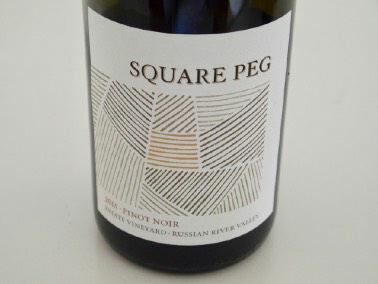 The annual production is focused on Pinot Noir and Chardonnay, with 75% of the grapes coming from Steve Dutton’s over eighty Dutton Ranch vineyards, primarily in the Green Valley sub-appellation of the Russian River Valley. A tasting room is open daily on Gravenstein North in Sebastopol. The wines are largely sold to a dedicated mailing list of wine enthusiasts. Visit www.dutton-goldfield.com. Goldeneye was founded in 1996 by Dan and Margaret Duckhorn who believed the Anderson Valley had the potential to be one of the finest regions in the world for growing Pinot Noir. Pinot Noir is now sourced from four estate vineyards within the Anderson Valley: Gowan Creek in the heart of the Anderson Valley on the valley floor, Confluence located on both hillside and valley floor sections, Split Rail located riverside on the valley floor, and The Narrows located in the very cool, northern “deep end” of the valley surrounded by redwood forests. The entire Pinot Noir program encompasses 200 vine acres and more than 24 distinctive clones. Single-vineyard bottlings are offered from each of the estate vineyards. When blended together in the Anderson Valley Pinot Noir, the representation of the region as a whole is brought to light. The Ten Degrees bottling is a reserve selection. The current winemaker is Michael Accurso, who joined the winery in 2012 and worked alongside previous winemaker Michael Fay. He also managed vineyards for a number of wineries including Copain and Littorai while a vineyard manager for Ardzrooni Vineyard Management. The picturesque Goldeneye tasting room is located in Philo overlooking the Confluence Vineyard. Visitors are welcome daily. Visit www.goldeneyewinery.com. The wines reviewed here were cellared and bottled by Goldeneye in Hopland, CA. La Crema, dating to 1979, is one of the most dependable brands in the Pinot Noir marketplace. The original name of the winery, La Crema Vinera or “Best of the Vine,” set the standard for the winery. 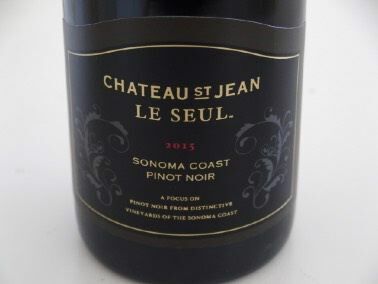 A member of the Jackson Family Wines portfolio, this winery focuses solely on Pinot Noir and Chardonnay from cool-climate appellations in California and Oregon. La Crema wines are widely distributed in the retail marketplace. For years, there was a tasting room in Healdsburg. Now consumers can also visit the La Crema Estate at Saralee’s Vineyard in the Russian River Valley to sample La Crema wines. Visit www.lacrema.com for details. This winery, part of the Jackson Family Wines portfolio, is unique in that only single clone Pinot Noir wines are offered from the Maggy Hawk Estate Vineyard. Each wine is the series is named after a horse born to Maggy Hawk, a winning thoroughbred. 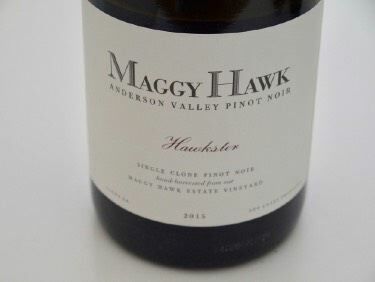 Readers know that I have a special fondness for the Maggy Hawk Pinot Noirs. 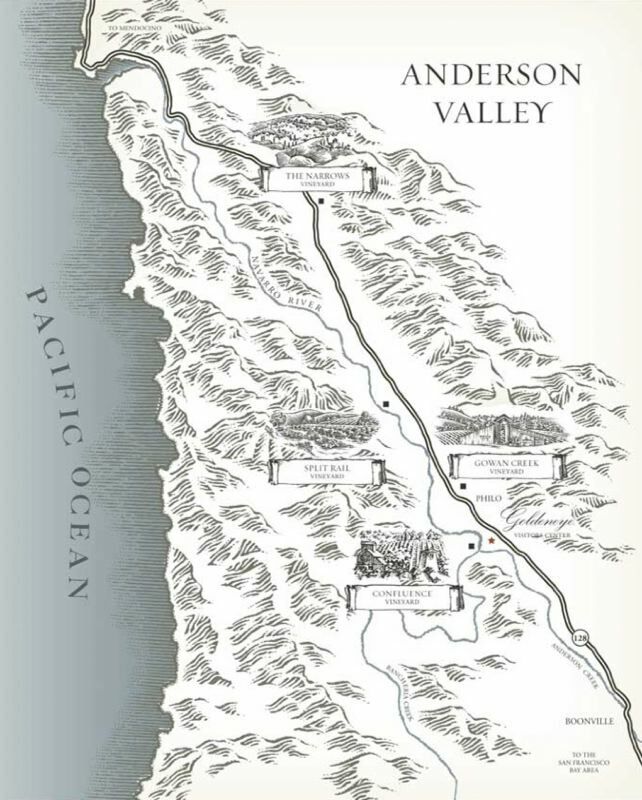 The vineyard is situated in Philo, in the “deep end” of the Anderson Valley among redwoods and is one of the last vineyards before one reaches the Pacific Ocean. It is a complex patchwork of different facings, slopes and clones. The soil is decomposed sandstone, known for exceptional drainage and low nutrients. In most vintages, yields are very low, no more than two tons per acre. The winemaker is Elizabeth Douglas who joined La Crema in 2001, became the Director of Winemaker in 2010, and WindRacer more recently. 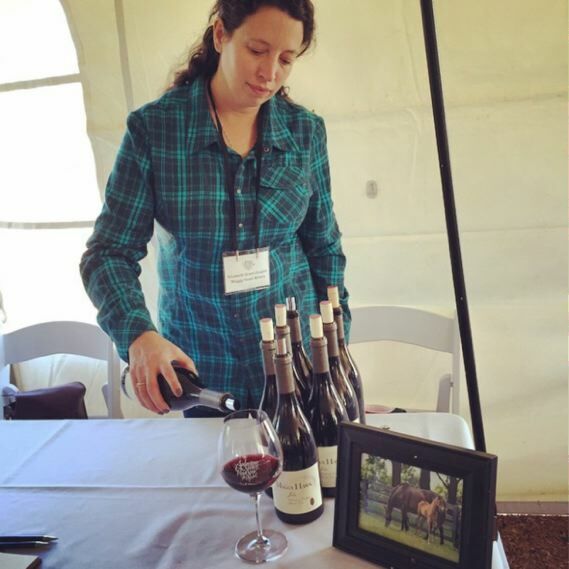 The photo below shows her pouring at the Anderson Valley Pinot Noir Festival. I have toured the vineyard with Elizabeth and found she possesses a close bond with this special property. Elizabeth is a Canadian native who became one of the first to graduate from the Cool Climate Oenology and Viticulture program at Brock University in the Niagara Region of Ontario, Canada. Maggy Hawk wines are available on an allocation basis to mailing list members. Visit www.maggyhawk.com. Taste the wines at the annual Anderson Valley Pinot Noir Festival. 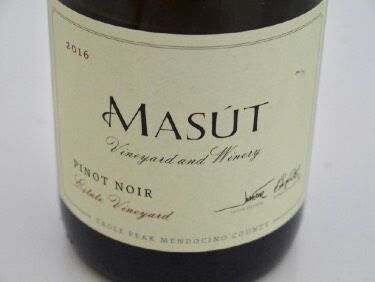 Third generation vintners Ben and Jake Fetzer began planting the first vineyards at Masút in 1997 and by the early 2000s, many wineries were beginning to see the potential of the site untapped for growing Pinot Noir. They spearheaded a petition for a new AVA called Eagle Peak Mendocino County (approved in 2014, Masút is the sole winery in the AVA), and converted a barn on their property to a winemaking facility, becoming a bonded winery in 2009. They released their first vintage in 2011, dedicating it to their father, Robert Fetzer, who tragically passed in a rafting accident in 2006. The 1,200-acre Masút property features rugged, sloped terrain and fast-draining soils. Elevations rise from 800 feet to almost 2000 feet. 40 acres are planted to Pinot Noir, including Dijon clones 113, 115, 777, and Mariafeld, Mt. Eden, Swan and Masút clones, and Chardonnay including Wente and Dijon 96 clones. 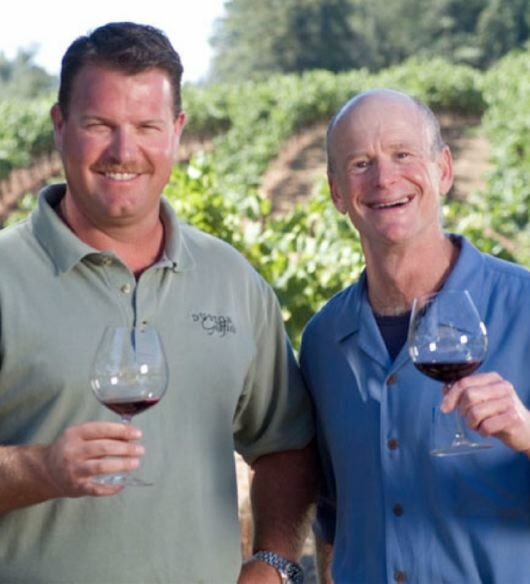 I have followed the Fetzer brother’s wines since the initial release and although the wines have always been very good, I have seen improvement due to maturity of vines and increasing winemaking acumen. The 2016 Estate Vineyard Pinot Noir is the culmination of years of hard work and is truly a magnificent wine that deserves a toast. Masút wines are sold through the winery’s online store at www.masut.com. Private tours and tasting are available by appointment. Veteran winemaker Jeff Gaffner directs the wine program at this modern and progressive winery that is an inspiring showpiece in Sonoma Carneros. The winery works with marquee vineyards of Sonoma County and Carneros, as well as the 28-acre estate vineyard planted to seven grape varieties. The 2015 Chardonnays are also noteworthy and are reviewed later in this issue. With fewer bottles available from the light crop in 2015, these wines will sell out quickly. Appointments for tasting that includes food pairings are recommended and are held in several venues at the winery. The wines are sold at the winery and through a mailing list. Visit www.ramsgatewinery.com. This family winery is an accomplished producer of Pinot Noir and Chardonnay, primarily produced from vineyards in the Corralitos region of the Santa Cruz Mountains. Pronounced “SAHNtay Are CAN Juh Lee,” the winery is named after a real person, winemaker John Benedetti’s great-grandfather. He built an historic business in the small farming town of Pescadero on the coast of California. 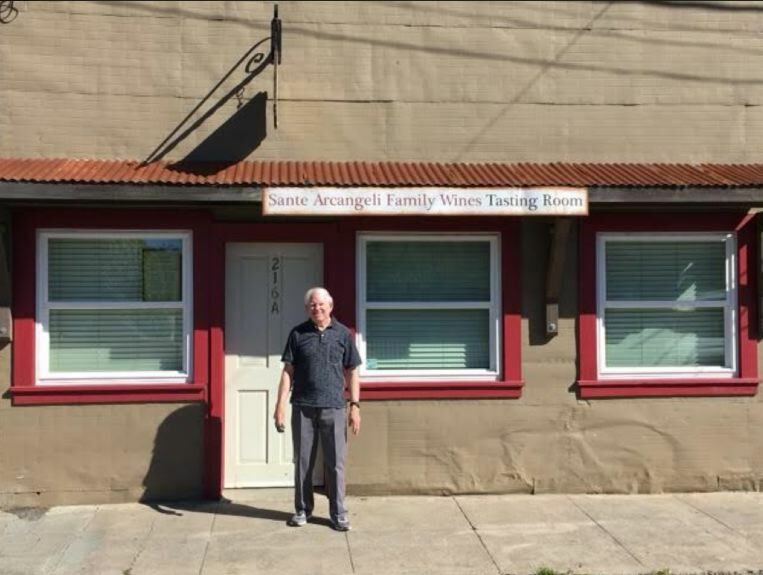 Sante Arcangeli’s grandson, Norm Benedetti and his spouse Shirley, guided the business to become known as Arcangeli Grocery Company, a world-famous bakery and gourmet market. It is now owned by Sante’s great-grandchildren, John’s brothers Mike and Don. The winery was named after John’s great-grandfather as a means of honoring all those in his family who came before him. John taught himself to brew beer in his late teens and segued into wine in his mid-30s with the guidance of winemaker Ryan Beauregard, the Brassfield family, and winemaker James MacPhail. The winery’s quaint tasting room in Pescadero is open Friday-Sunday. See Prince in photo - he gets around. Visit www.santewinery.com to purchase wines, or visit the Arcangeli Grocery Company in Pescadero for a unique experience. 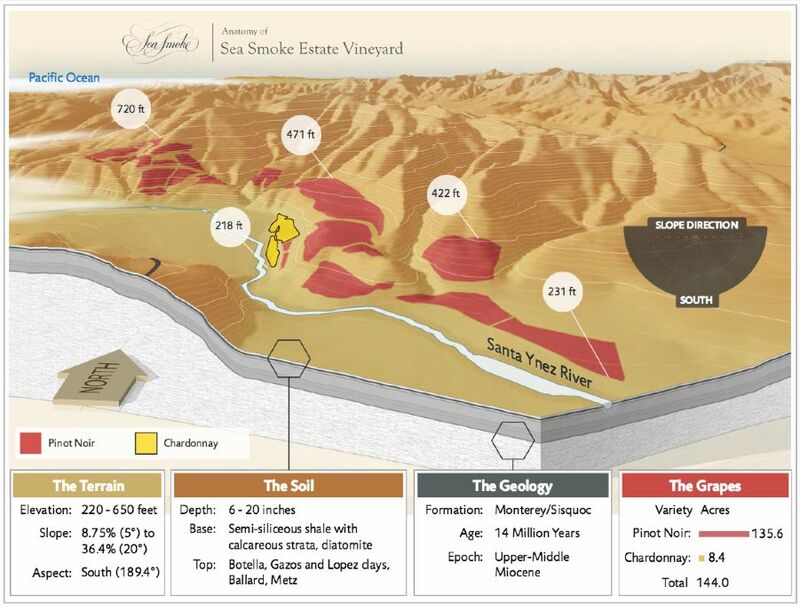 Sea Smoke wines are produced from the winery’s organic and biodynamic certified Sea Smoke Estate Vineyard that contains ten clones of Pinot Noir. Winemaker Don Schroeder has been at Sea Smoke since 2003. In 2015, yields were very low (about 1.5 tons-per-acre), but the small size of the clusters and grapes led to exceptional concentration. The winemaking goal with the Southing bottling is to create a marriage of complexity and elegance. Grapes are 100% de-stemmed, 5-day cold soak, then inoculated with cultured yeasts. Manual punch downs with a total maceration time of 14 to 18 days. Free-run and gently pressed wines were racked to barrels and aged 16 months. The Sea Smoke wines are sold exclusively to a mailing list at www.seasmoke.com. The 2015 Sea Smoke Chardonnay is reviewed later in this issue. Craig Senders, M.D., is an ear, nose and throat surgeon and director of the Cleft Lip and Cranial Facial Team at the University of California at Davis, who has provided free cleft lip and palate repair in developing nations for more than three decades. Along with his spouse, Karen, he founded Senders Wines to further international surgical outreach programs. Dr Senders harnesses his artisan winemaking skills, crafting wine and donating all of his winery’s profits to support surgical outreach efforts. Senders offers Napa Valley Cabernet Sauvignon, Carneros Pinot Noir and Napa Valley Sauvignon Blanc. Current production is about 500 cases annually. The wines are crafted at a custom crush facility in Napa, with one lot produced at home for a very personal experience. Visit the website for more information and to purchase wine: www.senderswines.com. 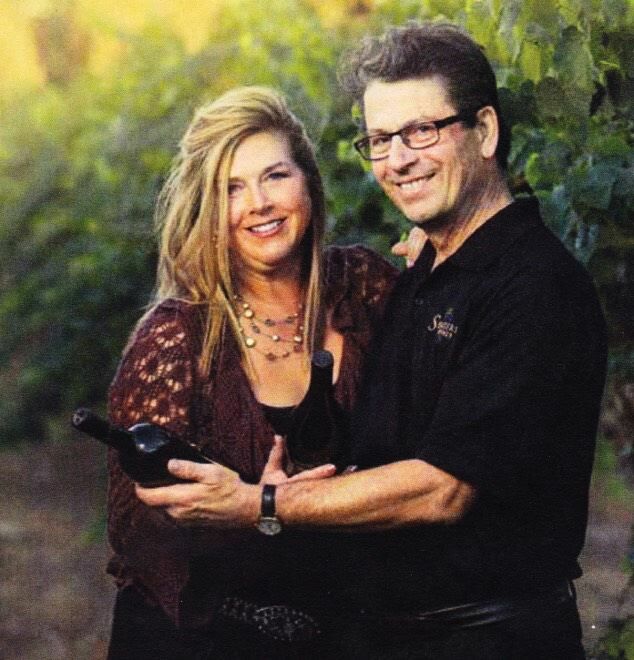 Kirk Wesley Hubbard and Denise Mary Selyem learned the wine business while working at Williams Selyem years ago and established a garagiste winery modelled after that iconic winery. Working out of a small warehouse facility in Sebastopol, the pair handle all the duties of a winery themselves, including personal time with those who choose to visit by appointment. 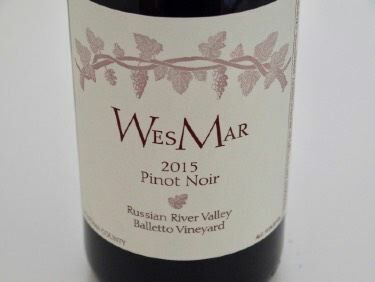 I first became interested in WesMar wines with their second release in 2001 that consisted of four Pinot Noirs and a Chardonnay. I believe I have tasted every wine they have made since. The couple knows the drill. Obtain the best grapes possible from growers who are committed to producing quality fruit. Employ many Old World methods such as hand sorting of grapes, open top fermentations in stainless steel fermenters (formerly milk tanks) once used at Williams Selyem, partial whole cluster, hand punch downs, no post-fermentation maceration, removal of wine from fermenters using only gravity and siphoning, and removal of grape skins by hand to be pressed. Once in French oak barrels, the wines are allowed to settle and clear naturally, removing the need for fining or filtering. The wines are aged one year prior to bottling in 50% new and 50% 1-year-old barrels. The only additions are yeast, malolactic bacteria, tartaric acid to adjust pH and sulfur for preservation. It is winemaking pure and simple. Search the PinotFile for extensive coverage of this winery through the years. Visit www.wesmarwinery.com for more information. WesMar is one of the few wineries that offer magnums of each bottling every vintage. The wines are sold primarily to mailing list members. The WesMar wines reviewed here are among the best they have produced in recent memory. The wines compose the annual spring release. The winery also produced a Russian River Valley AVA blend in 2015 (sold out). What Collectable California Pinot Noir Wines are Being Bought to Sell?